There was a time when chassis innovation was easier said than done. Manufacturers were typically hamstrung by available components, and if you had any intention of servicing the needs of enthusiast users, you had to follow a common guideline: make an enclosure big enough to house every conceivable part. The good news for consumers looking for something a little different is the chassis landscape is changing, slowly but surely. 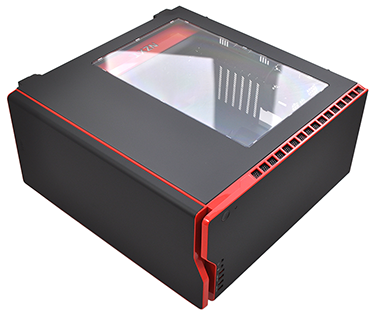 Small-form-factor cases are becoming increasingly popular for mainstream builds, and in the high-end space, most of the big names are doing their utmost to mix things up. NZXT is one such name, and with the recently-released H440, priced at £92, it is encouraging users to bid adieu to the age-old optical drive. It's a small, logical change, and one we feel should have happened a couple of years ago. Digital downloads, clearly, are the way forward, and external drives are an available option for those who remain attached to physical media. Though, that's obviously no consolation to anyone using 5.25in bays for fan controllers and other paraphernalia. 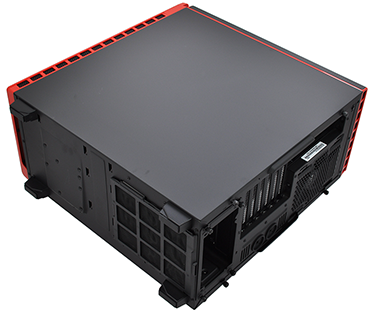 Still, dropping the optical bays has allowed NZXT to create a high-performance enclosure that isn't quite as deep as usual and looks sleeker in terms of exterior appearance. 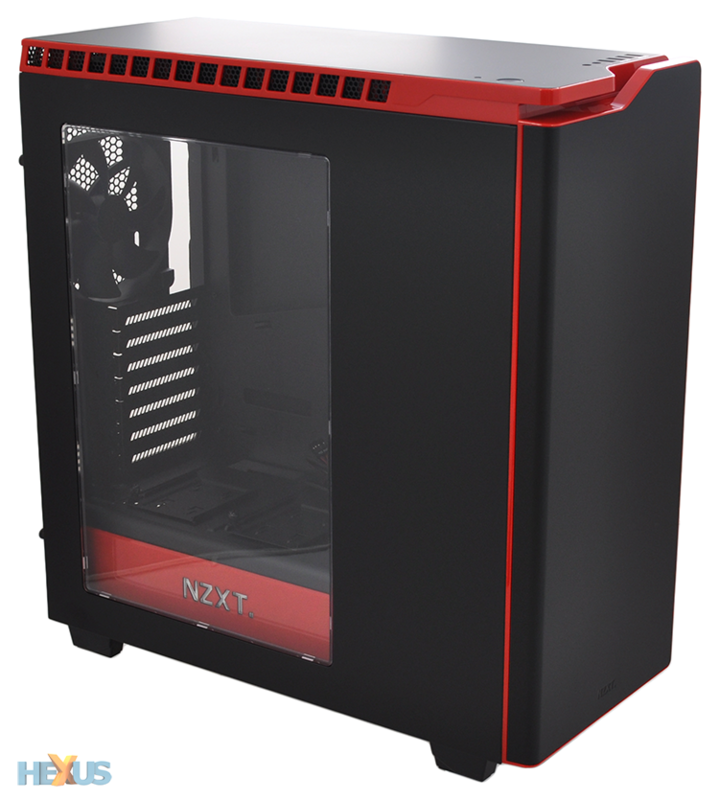 There are no interruptions to the front face, and save for the customary NZXT styling, the box as a whole looks neat and tidy. Aesthetically speaking, NZXT's chassis tend to elicit a love-it-or-loathe-it reaction, and the H440 continues that trend. There isn't a plain-black option, but we're happy to see a good choice of colour options. These include Glossy White, or Matte Black with a choice of Red, Orange, Green or Blue Glossy highlights. Black/Red is a little too sinister-looking for our taste, and the matte finish is prone to scuffs and fingerprints, but more importantly, there's a colour option to suit just about every type of build. What we appreciate most, however, is that NZXT is moving away from the chintzy plastic frames of old to enclosures with a little more substance. 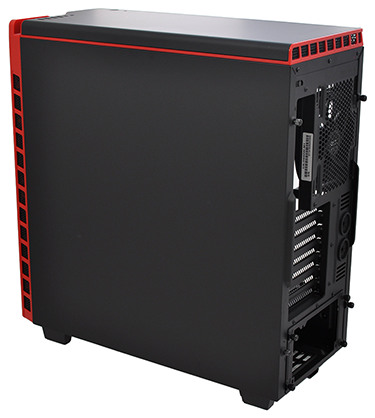 With the H440, the removable top and front panels have a steel centre to give them extra rigidity, and though there are still plastic elements, the whole chassis feels strong and well put together. All of the I/O ports - two USB 3.0, two USB 2.0 and audio jacks - are neatly arranged on the top-front edge, along with a backlit power button and a small reset switch. It's worth pointing out, also, that the front panel isn't a door - it looks that way, but the lip at the top is merely there to help get the covers off. Covering-up is a recurring theme in the H440, though NZXT has made airflow provisions with a series of mesh vents that line the sides of the front and top panels. The main side of the chassis has a near-full-height window that blends in well and provides a clear view of all the internal hardware. Elsewhere, the case stands on four rubber-tipped feet, and a couple of dust filters help keep out unwanted dirt. One is positioned underneath the PSU and pulls out at the back, while the other is a tall magnetic filter that sits behind the removable front panel.